So our wedding is slowly on its way and it is time to pick flowers for my bouquet and of course center peaces. I feel little stressed about the matter. I usually buy very colorful flowers to our apartment and honestly something in the bright colours ( especially yellow and orange like a sunshine ) always catch my eye. But when it comes to our wedding i feel little confused. I still love bright colours but then again i worrying that dramatically colourful bouquet will take all attention on itself and i as a bride will be forgotten. Hehe, i know it's silly but i wonder about it.. If you are in a similar situation as i am, and you just don't know what would you have as your bridal bouquet. Then maybe you should choose those flowers that actually are close to your heart. When Prince William and his Catherine married last year i was as much waiting to see the dress as i was to see her bridal bouquet. Curiosity was HUGE! And i loved both! 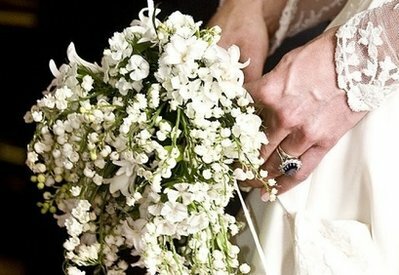 According to statement on the Official Royal Wedding Website, the bouquet was a shield-shaped wired bouquet of myrtle, lily-of-the-valley, sweet William and hyacinth. Anemone — on a darker note indicates fading hope and a feeling of having been forsaken. On a positive note it symbolizes anticipation. Daisy — Innocence, loyal love, I'll never tell, purity, love that conquers all, beauty, simplicity. Rose — love, passion, perfection. Personally i so far love lily of the valley, rouses and stephanotis for my bridal bouquet. What would you like for yours ?